May 2018 – This month all LP levels focus on fostering independence at home and school. Whether you are a parent or teacher, your goal should be self sufficiency in as many areas as possible. At home, a guiding question is “what am I doing for my learner that they can (or should) do for themselves?” Is your learner mastering the basics of self-care and home care? 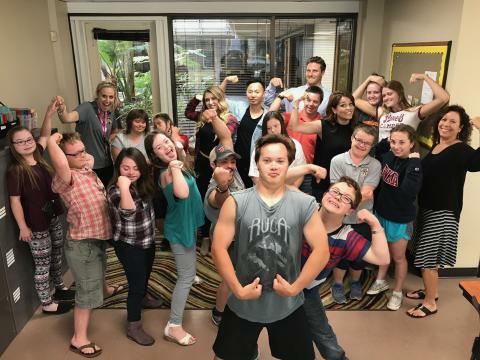 At school, a guiding question is “what would my learner be doing if they did not have Down Syndrome?” What is happening in class, at lunch, or during transition times or special events? What are typical peers doing during this time? Is the team fostering independence whenever practical? As Patrick Schwartz said in “From Disability to Possibility,” as the “student gains more skill and moves toward greater independence, team members reduce their supervision and assistance.” Is this happening for your learner? As we all know, our kids are getting older every day. Are we equipping them for self-sufficient adult lives?